Russian space agency also on the hunt for extraterrestrial life – Russia’s space agency recently released a draft of their Federal Space Program for 2016 to 2025, and it includes their plans to join the European Space Agency (ESA) on the ExoMars Program whose mission is to hunt for signs of extraterrestrial life on Mars. The alien hunting program Roscomos is participating in is one that was created by the ESA and for a period of time was going to be executed in participation with NASA. 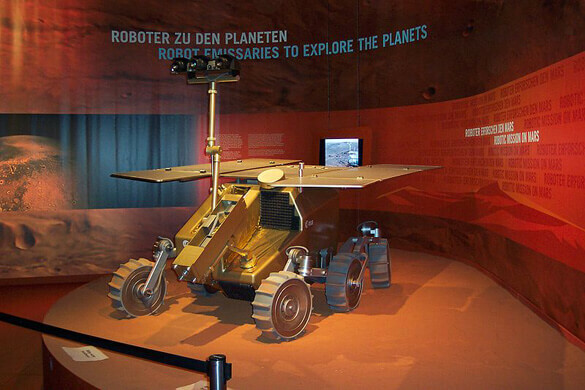 It was part of the ESA/NASA Mars Exploration Joint Initiative. However, the ExoMars program was defunded on the U.S. side in 2013 purportedly due to cost overruns of the James Webb Space Telescope. After NASA pulled out, Roscosmos jumped in, and as they put it, “thereby taking the place left by NASA.” It is an ambitious project that includes four spacecraft. There will be an orbiter, two landers and a rover. The first part of the mission will include the orbiter and a lander, and is currently scheduled to be launched by a Roscomos Proton rocket in January, 2016. The orbiter is called the Trace Gas Orbiter (TGO), and it serves many purposes. It will be used to survey Mars’ surface for landing sites, serve a sa communications relay for the landers and rover, map the distribution of near-surface water, and analyze the climate, including searching for and analyzing methane gas. The detection of methane is important because one source of methane is microbes. Previously, NASA reported that their Curiosity rover did not detect methane at a high enough level to support the idea that it stems from a biological source. However, scientists did point out that if life existed in the past, most of this methane could have been depleted. It is hoped that the TGO will be able to further analyze the methane that has been detected on Mars to discover its origins. The lander that will accompany the TGO in January is called the Schiaparelli Descent and Landing Demonstrator Module (EDM) Lander, and, like its name indicates, one of its main goals it to test the ability of a lander to safely descend and land on the Martian surface. Once there, it will also check the atmosphere and Martian weather. It includes a camera, so there will hopefully be some dramatic footage of its landing if it survives the trip. The lander is expected to arrive in October 2016. 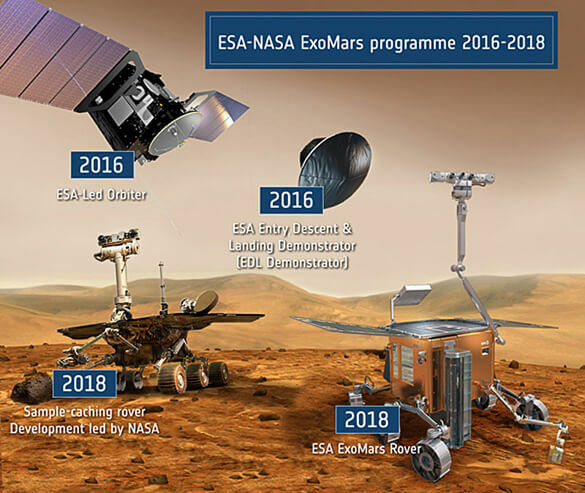 The second ExoMars launch is planned to for May 2018. This package, which includes a lander and a rover, is expected to touch down on Mars in January 2019. The rover will have a drill which will pull Martian samples into an onboard lab for analysis. It will have the ability to look for biomolecules and biosignatures from life that exists, or existed, on Mars in the present or past. This is yet another project in the hunt for evidence of extraterrestrial life, which is the crux of the majority of the research on Mars, according to Seth Shostak, senior astronomer for the Search for Extraterrestrial Intelligence (SETI) Institute. Perhaps Mars is the place we will find it. Although, what a rub it would be if the ESA and Roscomos find it without the participation of NASA. Then again, there are scientists who feel we have evidence of extraterrestrial life on Mars right here on Earth. The race is on.